The sport is known around the world as BOWLS, LAWN BOWLS, and BOWLING ON THE GREEN. Particularly in British Commonwealth countries, it’s a country club sport. 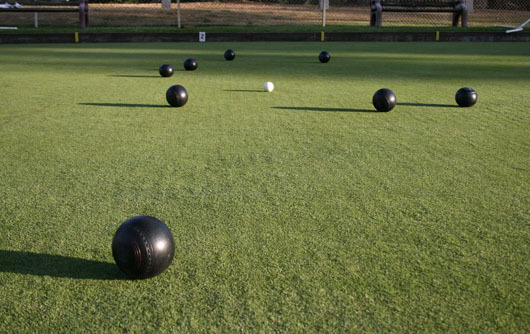 In the U.S., bowling greens are located mostly in public parks and private residential communities open to all. The games provides easy enjoyable exercise, friendship and camaraderie. With various levels of competition. Clubs usually have specified days and times that they bowl, but members have use of the facilities at all times. 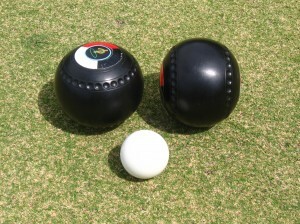 To score ‘points’ by rolling your ‘bowls’ closer to the target ball (the white ‘jack’) than your opponent. Bowls is scored by ‘ends’(similar to baseball’s ‘innings’). The player or team with the most points after all ends of a match are played is the winner. The timing of everyday matches is generally determined by the number of ‘ends’ played. An everyday casual match of 12 ends will usually take about one hour and 45 minutes. A competitive league/tournament match of 15 ends might last up to two and a half hours. The ‘type’ of match will also affect the length of games. “Singles’ matches (one vs. one) will take less time than matches with 2 or 3 players per team. A matched set of four ‘bowls’ (not balls) that are contoured (not round) and weighted so that they will not roll in a straight line approximately 3 to 3 ½ pounds each, available in a variety of styles, colors and sizes. A set is always available for loan to new players for instructions and demonstration. New bowlers can continue use of these loaned bowls for a period of time. There are used and new bowls that can be purchased. Flat soled shoes must always be worn. Your going to be amazed that a membership with full club priveleges costs just $5.00 per month. Paid annually, that’s ONLY…. $60.00 for a full calendar year! WHAT ARE YOU WAITING FOR, CALL TODAY.